While the rest of India was under the British Raj, there were two enclaves in India, under the rule of European colonial powers. Goa under the Portuguese and Pondicherry under the French. While Goa is known to every one, and is very popular, Pondicherry has not been that much highlighted. Every one who is some one talks about Goa, people feel its the place to be, famous for partying and fun. But yet no one talks of Pondicherry as being a happening place, no one I have heard speaks of honeymooning in Pondicherry or Pondy. Also while you have many De Souzas, De Costas, Gonsalves in Goa, you don’t hear of Depardiues, De Gaulles, staying in Pondy. But still Pondy has a charm of its own, a gentle laid back charm, which helps you to soothe your soul. Its very quiet, calm and tranquil. It certainly is not the most beautiful of places, the Indian section is like any other Indian city, dirty noisy and crowded, but is still charming. Though early excavations at Arikemedu, have confirmed an ancient Roman settlement there, the actual history of Pondy begins with the French. There is a legend that sage Agastya had his Ashram there, and Pondy was used as a port during the Pallava, Chola, Pandya, Vijayanagar periods. The Portugese later set up a factory but compelled to leave by the Sultan of Gingee, under whom Pondy was at that time. Later the Dutch set up posts in Porto Novo, Cuddalore, and in order to counter their influence the Sultan of Gingee invited the French to take over in 1673 AD. This proved to be a turning point in the History of Pondicherry when Bellanger, a French officer took charge on 4th Feb,1673 AD. In 1674 Francois Martin the first French Governor converted this into a port town. The Dutch and French fought many bitter wars over this and in 1699 the French regained Pondicherry after the Dutch signed a treaty with them. The 18th century saw the town grow on a grid pattern, which stays even to this day. Able Governors like Lenoir, Dumas and above all Dupleix(1742-54) laid the foundations of Pondicherry and turned it into an important town. But the arrival of Robert Clive changed all the plans and recaptured many important territories from the French like Madras, Arcot, etc. Dupleix had to return to France in disgrace and the French sent Lally Tollendal to regain the territories. Though they could regain Cuddalore, strategic mistakes saw the loss of Hyderabad and siege of Pondicherry in 1760 which was razed to the ground. 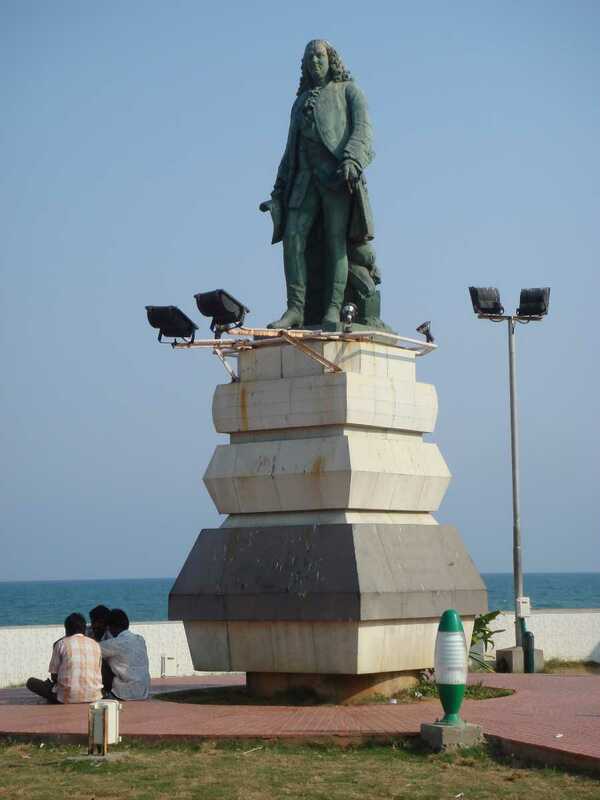 In 1765 Pondy was returned to the French by the English following the treaty signed between them. France and England fought many bitter wars over this town and it was only in 1816 that France could gain permanent control over Pondicherry. Though India gained independence in 1947, the French handed over Pondicherry to India in 1954. The entire town is divided into 2 sections, the French quarter and the Indian quarter. The entire town is patterned on the French grid pattern. To a visitor the French influence is unmistakable. The French names of the streets, the French style villas, the afternoon siesta when nothing stirs, the bicycles on the streets. One could be forgiven for thinking that they are in some old Mediterranean town popularized by Hollywood. In the French quarter, the buildings are typically colonial style with long compounds and stately walls, the like of which we see only in Hollywood romances. The Indian (Tamil) quarter consists of houses lined with verandas, and houses with large doors and grills. 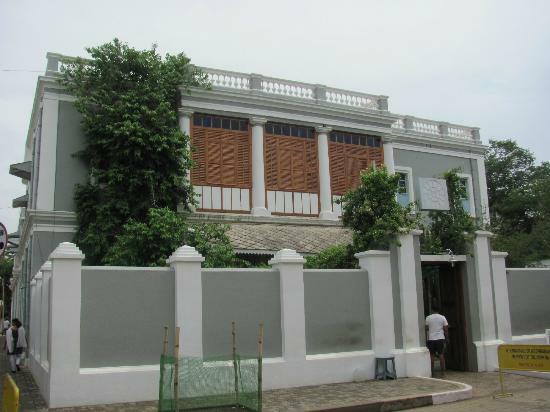 Truly walking through the streets of Pondicherry is like traveling in a time machine, we see the type of houses we have only read about. This is one place that still has not been ravaged by tourism. Churches coexist with temples, the cops wear French hats, one can stroll across the beach road leisurely (unimaginable in Marina Beach road). French and Tamil are equally spoken, while this must be one of the few places where one can see the French flag fluttering in India. Pondy truly represents the confluence of the East and West. Every place has its own distinguishing landmark which draws hordes of visitors for that place. Paris and Eiffel Tower, London and Big Ben, think Pondy and the first thing that strikes ur mind is the Aurobindo Ashram. Founded in 1926 by one of India’s famous sons, Sri Aurobindo and the Mother. Its a unique spiritual concept revolving around offering work as a Divine offering. There are no rituals, no compulsory meditation, no practices. But it revolves around only one principle: One must surrender to the Divine principle and an opening to the Divine force. The Ashram also contains the tomb of Aurobindo and the Mother. The Ashram also has farms, a printing press and libraries. While the Aurobindo Ashram is one of the reasons to see Pondicherry, there is another place that is a must see, Auroville the City of Dawn. Its a unique township never seen of its kind in India. It was an experiment for celebrating unity in diversity. It was founded on Feb 28,1968 when youth from 128 nations and Indian states met together and placed the earth from their native places in an urn, symbolic of international understanding. Located a few kilometers from Pondy, at the center of the township stands Matrimandir built in the form of a globe, its a place for quiet concentration. There are 80 settlements and 1500 people engaged in various activities like reforestation, organic agriculture, health care, village development etc. At present it is managed by the Auroville foundation. Pondicherry is also a famous educational center with the famous JIPMER (Jawaharlal Institute of Post Grad Medical Educational Research) and Pondicherry University is one of the better known Universities in India. It is easily accessible from Chennai, 3.5 hours along the scenic East Coast Road, via Mammallapuram. A Blend of east and west, the modern and the traditional, the old and new, Pondicherry is a living example of coexistence and unity. This was also the place where the great Poet Subramnya Bharati spent his years in exile. This entry was posted in French Colonial Rule, Pondicherry and tagged Dupleix, French Rule, Pondicherry. Bookmark the permalink. 1 Response to Pondicherry- French Paradise in India. Hey I had Mine, I mean Honeymoon in Pondicherry! A Beautiful Place ! takes You back to those French Colonial Days! Thank You for Sharing the Blog and Bring back some of those Memories and Places!